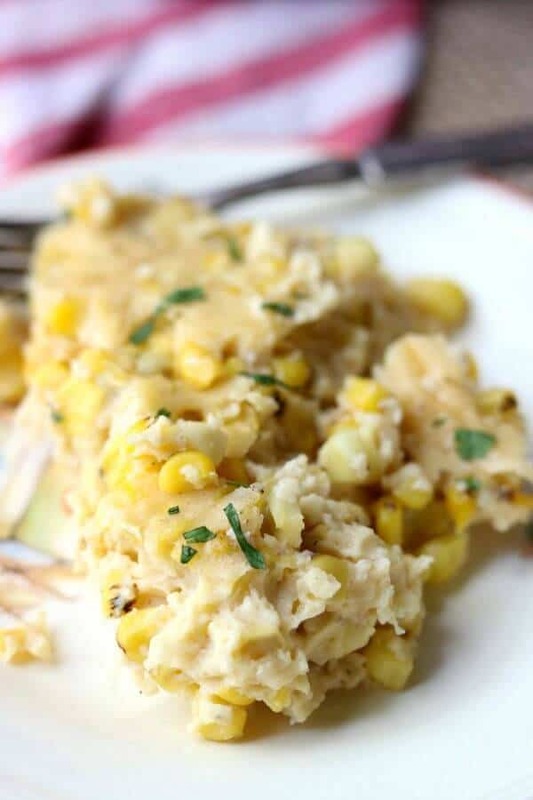 This Southern Corn Pudding recipe is such an easy, make ahead side dish! Fresh corn and smoky chipotle are partnered in this classic casserole to give it a yummy update that’s sure to get rave reviews. Many thanks to Central Market for partnering with Restless Chipotle and sponsoring this post to bring you another delicious Thanksgiving recipe! 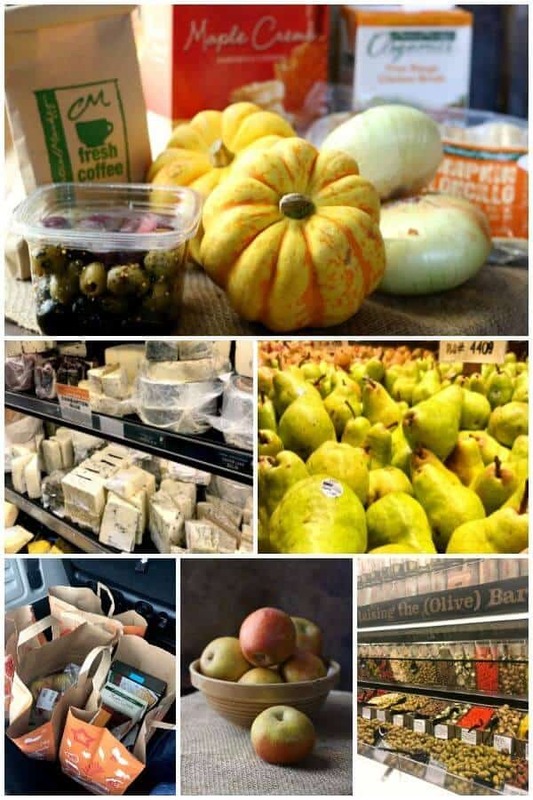 Are you ready for another Central Market adventure? I swing between being sad that Central Market is 30 minutes away and being glad that Central Market is 30 minutes away. You see, I spend hours there. Not because it’s difficult to navigate – it’s not. I love how it’s laid out in mini-stores within the big store. At the Central Market I go to on Lover’s Lane in Dallas you walk into the store at the produce section. I swear to you I hear the Hallelujah Chorus when I step through those doors. There are miles of fresh produce of all kinds and I want to look at everything. There are so many different colors of cauliflower, scads of seasonal fruit – and not just your run of the mill grocery store stuff. I’m talking about heirloom apples and unique things that even I don’t know how to use. Which is ok because that leads me to the OTHER thing I love – Central Market has experts on hand to tell you about everything and answer questions. You won’t find stockers leaning against a stack of boxes talking on cell phones, you know? 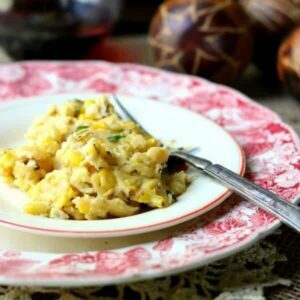 So I picked out the fresh corn for my Southern corn pudding – I prefer to use fresh but you can use frozen – and some buttery orange color cauliflower for something I’m doing on Lowcarb-ology. I like to shop early to get my stuff for Thanksgiving. I don’t like crowds and I don’t like the stress of trying to grab stuff last minute. I like to meander, yes meander, through the store and take time to look, touch, smell, and ask about ingredients I am not familiar with — and taste samples. It takes me almost as long to get through the cheese shop as it does the produce area if that tells you anything. I brought home a couple of different kinds of coffee beans because I’m not sure which coffee I want to serve on Thanksgiving and I’ll make a few cups to help me decide. Although it’s too early to bring home any of the prepared products ( I love their chipotle quinoa salad!) I grabbed things I knew I’d need – cheese, crackers, and olives from the olive bar for appetizers and that type of thing. I’l be going back closer to Thanksgiving Day for the rest of it and my final coffee choice. I’m leaning toward the Costa Rica Honey that’s in my cup right now. By the way – if you’re like me and you have a tendency to want everything to be perfect this note is for you. Working yourself to a frazzle for the holidays is not good for you and it doesn’t make the happy memories you want for your family. Central Market has all kinds of chef prepared foods to round out your menu and make it easier for you to concentrate on the things that really matter. Check out Central Market Holiday Hotline — You can order ready to heat and serve meals, sides, desserts, and tons more. The roasted butternut squash with citrus and pecans… is…so dang good. Corn is a fixture in the south. Corn bread, corn cakes, corn pudding – I’ve even made a sweet corn pound cake. It represents home and comfort, I think. Plus it’s inexpensive. 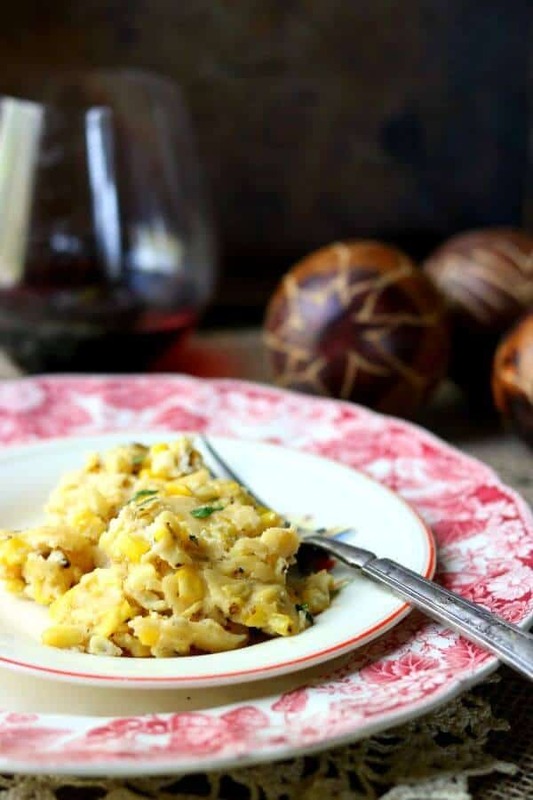 This Southern Corn Pudding is great as a side dish but you can also add some ham, bacon, or cooked sausage and turn it into a budget pleasing main dish. The recipe uses some very simple ingredients but the flavors pop – it’ll have you saying y’all in no time. I’ve jazzed the original up a bit with some chipotle – I think you’ll love it. It’s one of those heirloom recipes that disappears fast at potlucks and everyone calls you the next day to ask how it’s made. You know what I’m talking about. This corn casserole is so easy to make you pretty much don’t need to worry. Still, like anything, experience has shown me a few things to keep in mind. This is NOT bready. Don’t overbake it – it will be golden brown around the edge and a little jiggly in the middle. It’s more like a custard – if it’s done a knife inserted int he center will come out clean. 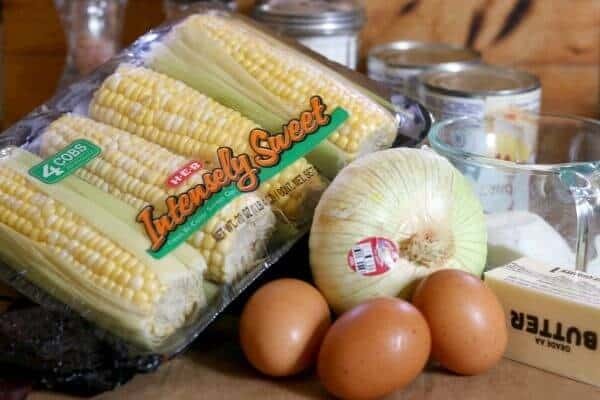 I use evaporated milk – I think it gives the corn pudding a rich texture without a lot of extra calories. You can use milk, light cream, or heavy cream instead if you want to. 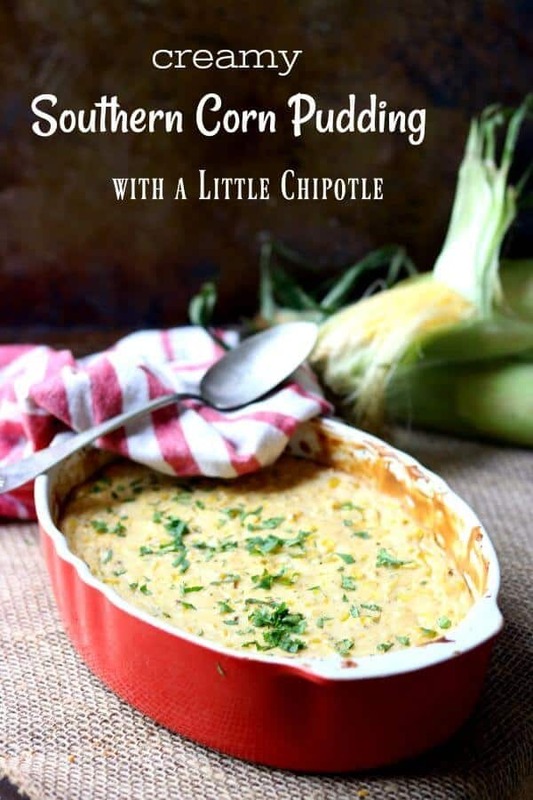 Most of the flavor in this recipe comes from the corn. That means that the tastier the corn the better the flavor of the Southern Corn Pudding. Fresh corn is best – just cut it off the cob with a sharp knife. If you’ve never done this – don’t try to get the kernels off whole. Just cut straight down to remove the kernels (it usually cuts them in half) then scrape what’s left on the cob into your bowl. I fire roast the corn with my handy-dandy plumber’s torch. I like the flavor it adds but it’s not a necessary step. Be sure to whisk the eggs, milk, and butter together before adding other ingredients. Can you freeze corn pudding? YEP! Wrap it tight and freeze if for up to 2 months if you want. 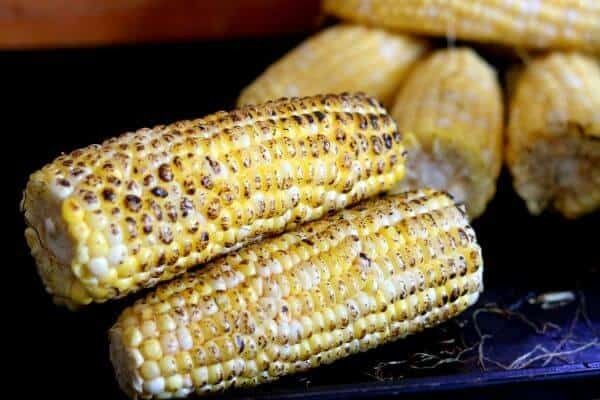 Fire roasting the corn gives it a deeper, nutty flavor that really comes through in this Southern Corn Pudding recipe. It’s not difficult to do – in fact there are several ways to do it. You can fire roast on a grill, on a gas burner, or my favorite way – with a plumber’s torch. Peel the corn and take off excess silk. Put the corn on a non-flammable surface. Turn on the plumber’s torch and light it. Slowly move the flame along the corn until the kernels begin to blacken. Rotate the cob and repeat until all sides are done. Don’t hold the flame in one place too long or the kernels will burst open. If you happen to have leftovers cut it into squares, warm it up, and serve with a little maple syrup poured over it for breakfast. Love this recipe? Please consider giving it a star rating below. ? Follow me on Facebook and Pinterest! 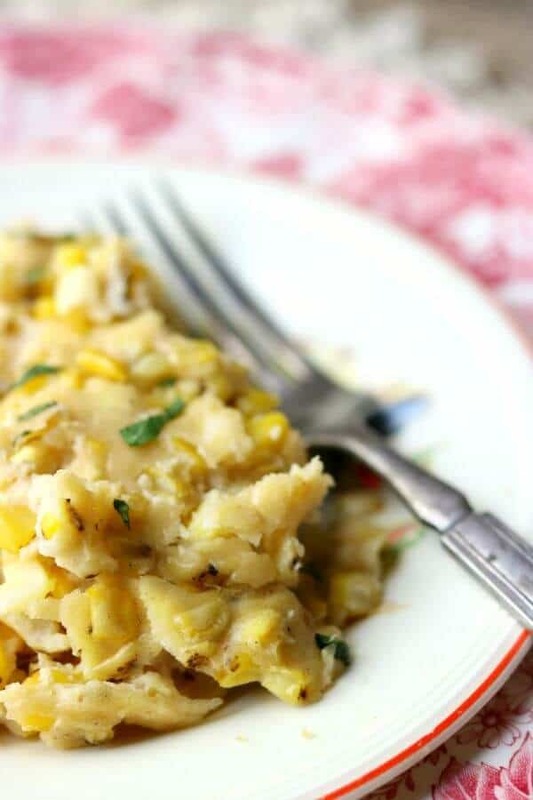 Fresh corn is fire roasted then cut from the cob to create this deliciously creamy side dish. 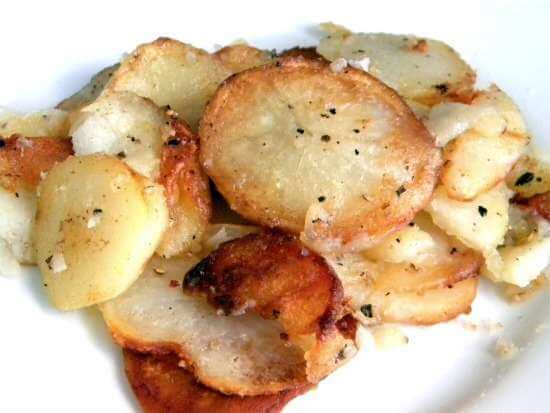 Melt 2 tablespoons of butter in a cast iron skillet. Add the corn - cook, stirring often, about 3 minutes. Set aside. Melt remaining butter in a saucepan. Add the onion and saute a minute or so. Add the flour, sugar, chipotle, pepper, and salt - cook about 2 minutes stirring constantly. Whisk in the evaporated milk and cream until mixture is smooth. Cook until it thickens. Remove from heat and set aside. Whisk in a half cup of the hot milk mixture to temper the eggs. Add the remaining milk mixture. Bake at 375F for 30 minutes - or until firm. To freeze this classic Southern Corn Casserole let it cool completely after baking. Wrap tightly and freeze for up to 1 month. Thaw overnight in the refrigerator and bake at 350F for about 20 minutes or until heated through. This is a sponsored post written by me on behalf of Central Market. What a shame we don’t have a Central Market! We’ve got a World Market, Fresh Thyme, Trader Joe, and some other chains. I love going to the grocery store — I see all the potential. 🙂 I’m definitely trying out this recipe. I really love creamed corn. This recipe with chipotle sounds like a delicious, kicked up twist. I pinned it!